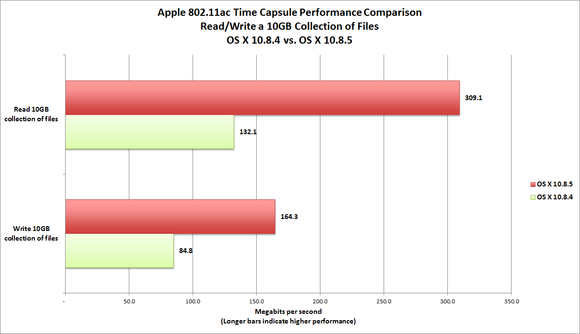 Well, it took a while, but Apple has finally resolved whatever problem was causing wireless file transfers using its new 802.11ac MacBook Air and Time Capsule to be so slow. If you haven’t already updated to OS X 10.8.5, do it now. When I benchmarked the new router last June, I noticed that real-world file transfers were much slower than the WiFiPerf benchmark indicated they should. WiFiPerf was reporting TCP throughput of more than 450 megabits per second (mbps) at close range, but transferring large files and large groups of files (10GB in each scenario) happened at less than half that speed. 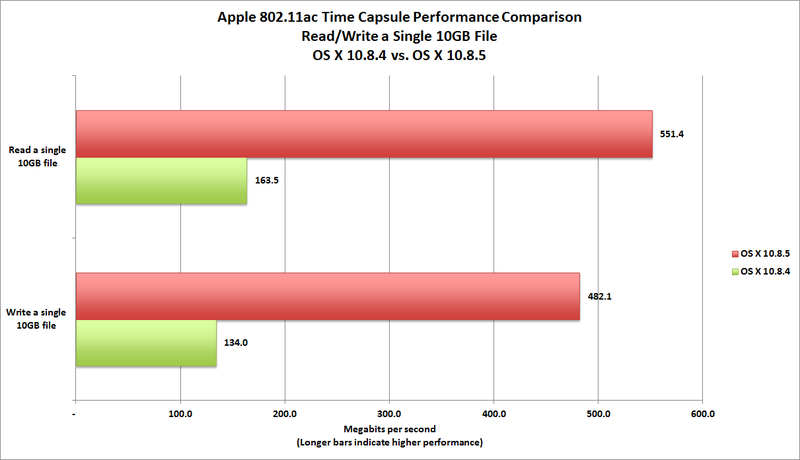 Once I updated the MacBook Air with the latest version of OS X (10.8.5, which includes a patch to AirPort Utility), and the Time Capsule with Apple’s newest firmware (version 7.7.1), real-world wireless file-transfer speeds more than doubled. With the old software, copying a 10GB collection of small files from the mechanical hard drive in an iMac hardwired to the router, to the SSD in a MacBook Air over the wireless network required more than 16 minutes to complete at 84.8 mbps. The new software/firmware cut the time required to transfer a 10GB collection of files across the wireless network by more than half. With the new software and firmware, the same task required slightly less than nine minutes because the file transfer occurred at 164.3 mbps. The speed at which those files were read over the wireless network (that is, copied back to the iMac from the MacBook Air) also more than doubled, from 132.1 mbps to 309.1 mbps. The speed at which I could copy a single 10GB file from the iMac to the MacBook Air jumped by an even bigger margin: from 134 mbps to 482.1 mbps. An operation that previously required more than 10 minutes could now be finished in less than five. Copying that file back to the iMac took place at 551.4 mbps, compared to 163.5 mbps before the updates. Copying a single 10GB file across the network requires much less time, thanks to the OS X and Time Capsule firmware updates. As I reported in my earlier review of Apple’s 802.11n AirPort Extreme, some non-Apple routers deliver better performance than Apple’s products, but they lack the Apple-specific features that make Apple’s routers so easy to use—at least with Macs. 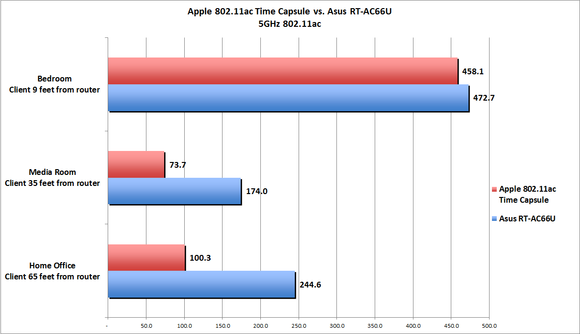 Since I compared the AirPort Extreme to an Asus RT-N66U 802.11n router in that story, I decided to compare the 802.11ac Time Capsule’s performance to an Asus RT-AC66U 802.11ac router this time (neither Asus model has an internal hard drive). Since router performance can be greatly influenced by atmospheric and environmental conditions, I always run fresh benchmarks for each router comparison I conduct, ideally testing all routers I’m going to write about on the same day (after updating the router's firmware and the OS on the client and server). That’s what I did in this case, using AccessAgility’s WiFiPerf to measure TCP throughput. As you can see in the benchmark charts, the Asus RT-AC66U delivered better TCP throughput at most locations inside my home. I suspect the Asus’s higher performance stems from its use of external dipole antennas that can be positioned to achieve the best reception. Support for 2.4GHz 802.11n is essential for connecting legacy hardware to your network. 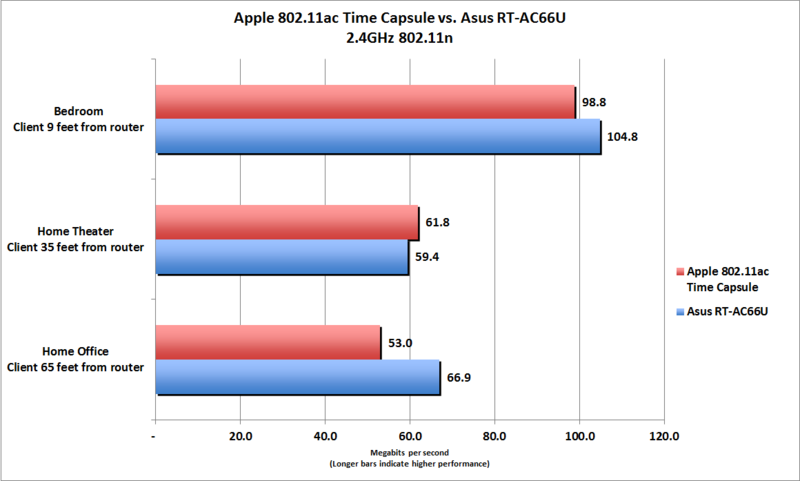 After testing the updated 802.11ac Time Capsule, I went back and compared its performance to the numbers I recorded in July. The router’s performance in the close-range test (with the MacBook Air and the Time Capsule in the same room, about nine feet apart) was roughly the same: 458.1 mbps now compared to 451.9 mbps then. And its TCP throughput was slightly faster when the client in the kitchen, about 20 feet from the router: 405.95 mbps now compared to 387.2 mbps then. Curiously, the Time Capsule's 802.11ac performance was much lower at long range that what it was before the updates. I repeated these tests several times to ensure I wasn’t seeing an anomaly, but the results were consistent. 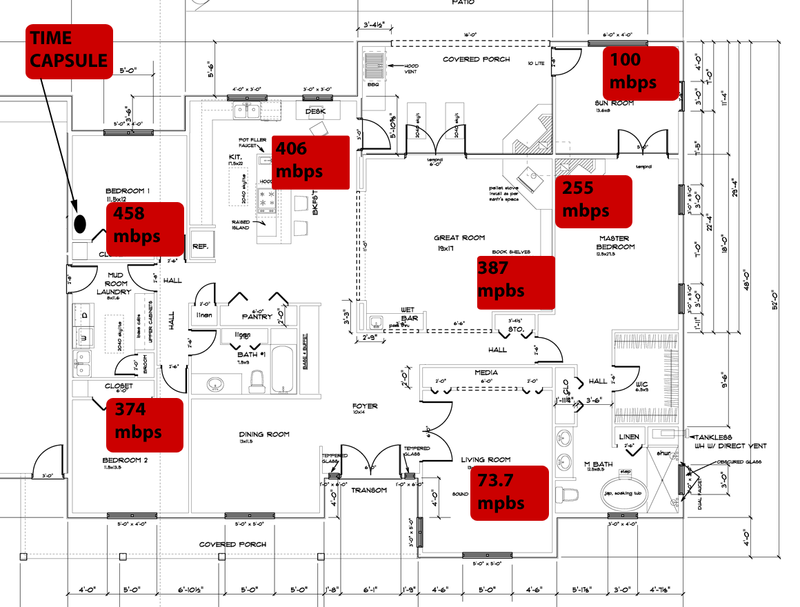 Fortunately, the 802.11ac Time Capsule delivered excellent performance just about everywhere else in my house (see the illustration of my home’s floor plan for details). I don't know if the new operating system and router firmware are responsible for this reduction in throughput. Apple's 802.11ac Time Capsule delivered excellent TCP throughput in every room inside my 2800-square-foot home. I suggested in my original review that Apple would solve the wireless file-transfer issues with a software update, and that expectation was baked into the 802.11ac Time Capsule’s score, so nothing changes there. I’m glad they didn’t make everyone wait for Mavericks to do it. 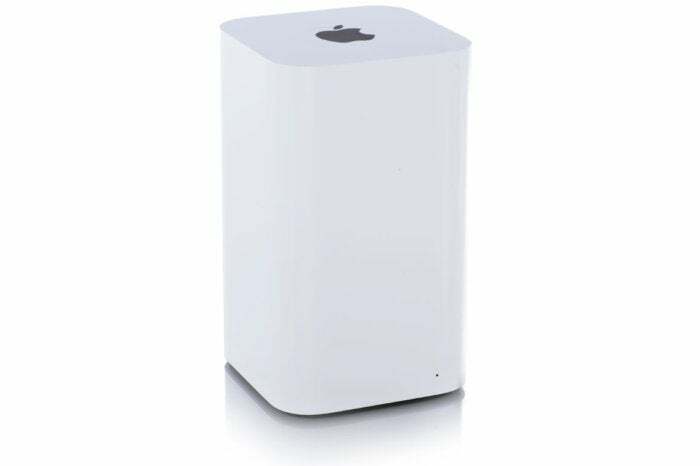 Apple's AirPort Time Capsule is a strong 802.11ac router that provides 2TB of shared storage for media and client backups.